Donate Design promotes the work in communities around the world that develop sustainable businesses to provide a livelihood to disadvantaged people, offer alternative industries to those that destroy the local eco-system, and preserve the human rights to social justice and culture. 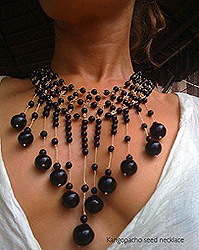 Donate Design introduces the work of Violeta Villacorta and the artisan communities in the Amazon. Violetta is running a fundraising campaign on Indiegogo. To support her work, contribute to her campaign here. My work with Amazon communities and artisans started with the Cofán Dureno community in the Ecuadorian Amazon in mid 2010. My initial trip served to connect with the artisans and community, and to learn they were looking to do as a community and as artisans. Our mission is to learn from communities – what they envision for themselves, not the other way around. The Cofán community works to develop their culture and protect their territory from extractive industries, which have left their land and resources devastated from oil contamination, costing many lives. We work with a group of women artisans, Asociación Sukû, who sought to have a center where they could work, showcase and store their crafts. The main source of income for this community is farming and craftwork. They work on crafts in their homes after a day’s work on their farms, however, they needed a place to come together to work. For years the oil industry has disrupted their livelihood, polluting the rivers and limiting the fish and food in the local markets, forcing many people to work outside the community. They want to bring work back into their community and earn their living in their traditional industries. Because the region does not attract many visitors and tourists, the artisans are looking to sell their arts and crafts to a broader market to earn a living from their creative work. I returned from my first trip with a long list of needs from the artisans, and organized a fundraiser to finance the construction of a traditionally designed building where artisans could work and showcase their crafts. The funds raised also provided a number of tools, including laptops, drills, and materials and supplies to enhance their work and performance, and connect the artisans and community with the world to share their artistry, culture and events. On my next trip, I stayed with the artisans in their community for a month. We financed an internet connection, and trained the artists in computer and internet skills. They learned applications, web tools and programs to help develop their artistry and business. This has made it easier for the artisans and community to directly communicate with and take orders from their market. I worked closely with the artisans to ensure the high quality of their products, and purchased samples to open sales in the US. This work with the Cofán opened the door to my work with a community in my native country, Perú. I met the indigenous Awajún-Wampis representative Ambrocio Uwak, at a Deep in Forests meeting in Tambopata, Perú. Deep in Forests is a network of native community leaders and sustainable entrepreneurs working to increase the value of standing forests and create sustainable solutions for the protection of the Amazon and its cultures. I was introduced to the Awajún of Urakusa in Amazonas, Perú, who live in a remote area in the rainforest, accessible by a 14 hour boat trip and 5 to7 hours by car. I was invited to visit by the artisans to explore the market for their arts and crafts outside of their community. 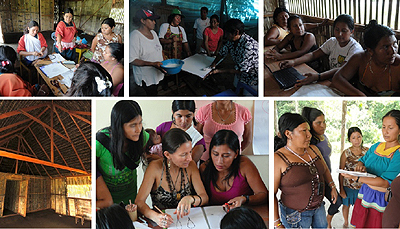 The Awajún Artisans is a group of over 50 women who work in an established artisans’ center. I looked at their operation, assessed their needs and worked on sample collections, taking sample with me back to the US. My input as a designer involves collaboraton with the artisans to create modern collections based on their traditional artistry, as well as promoting and selling their unique and traditional work. We have been working with the Awajún (and the Cofán), promoting and selling their arts and crafts, as well as providing tools and funds depending on their needs. We sponsor the artisans’ participation and register their associations in national fairs and trade shows in their native countries, as well as finance travel and fees to set up legal registration of their business that will allow the Awajún to open a bank account for their organization. Since we have been working with the artisans, we have been able to increase their sales and outreach by 95%. Our support has enabled them to connect with domestic markets and sell their goods independently, directly through venues, fairs and stores in Perú and Ecuador. We have opened new accounts and markets, and sell their exquisite work directly to customers in the US through our online store. It is our mission to empower communities, particularly the women who run the artisans’ associations, to help them develop markets for their art, so they can continue to cultivate the richness of their culture, wisdom and arts. This work creates sustainable, value-added enterprises for the Amazon as an alternative to harmful extractive industries. Our work supports their culture, livelihood and self-determination. There is much to be done and as more communities reach out for our support, we are committed to our collaborative work to further develop the businesses in the communities we work with, and to support new communities who reach out to us. This entry was posted in Community stories and tagged Amazon artisans, Bel Esprit, Donate Design, ethical fashion, fair trade, ORG by Vio. Bookmark the permalink.